Beautiful Affordable Weddings budget celebrant in Sydney. So now you can choose between four different wedding packages. You can have a low budget wedding ceremony at the celebrant’s place on the north shore of Sydney. Or you might choose to have your wedding ceremony at any other venue, midweek or weekend. So there are quite a few wedding packages to suit each and every couple. Stress-free wedding journey for you. Marriage certificate and Marriage registration. My PA system for the ceremony and your music. Unlimited contact with your marriage celebrant regarding the wedding. Wedding Package1 – you can have a small meaningful affordable wedding ceremony, personalized just for you, CHEAPER than at the BDM NSW registry. Just you and your two witnesses at the celebrant’s place – only $400. Wedding Package 2 – you can choose another package, still CHEAPER than at the BDM registry. In this package, you can have up to 15 guests attending your big day, celebrating with you your wedding ceremony day. Wedding Package 3 – you might like to consider a week-day wedding ceremony, Monday – Thursday at any venue you choose, at any time. Wedding Package 4 – weekend Friday – Sunday wedding ceremony So at this option you can have your wedding and any venue of your choice, any time. While it is a beautiful personalized ceremony, still very affordable fee including meetings, all legal work, professional PA system, readings, rituals and much more. All wedding legal procedures start with the lodgement of the NOIM. You can always decide later on which wedding package best suits you. You are not locked in on any package in any way. The wedding ceremony is one of the memorable aspects of your wedding day. A big part of planning your wedding in Sydney involves choosing a marriage Sydney who you relate to and who will deliver a service on your wedding day that is to your style, taste, as well as can best relate to you. Packages and Fees – Choose the right package for you. Contact me anytime if you have any question or if you would like to book and secure the day and start planning your wedding. 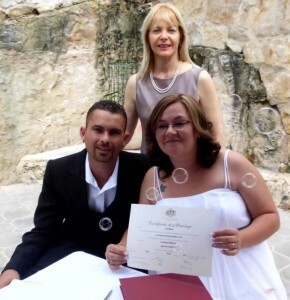 This entry was posted in Affordable Celebrant, Affordable Weddings, Free Garden wedding, Marriage celebrant, Sydney Celebrant, Weddings and tagged Affordable Celebrant, Affordable Wedding Ceremony, Budget Celebrant, Budget Wedding Ceremony, Celebrant, Cheap Celebrant, Cheap Wedding Ceremony, Free Garden Wedding, Wedding Celebrant.